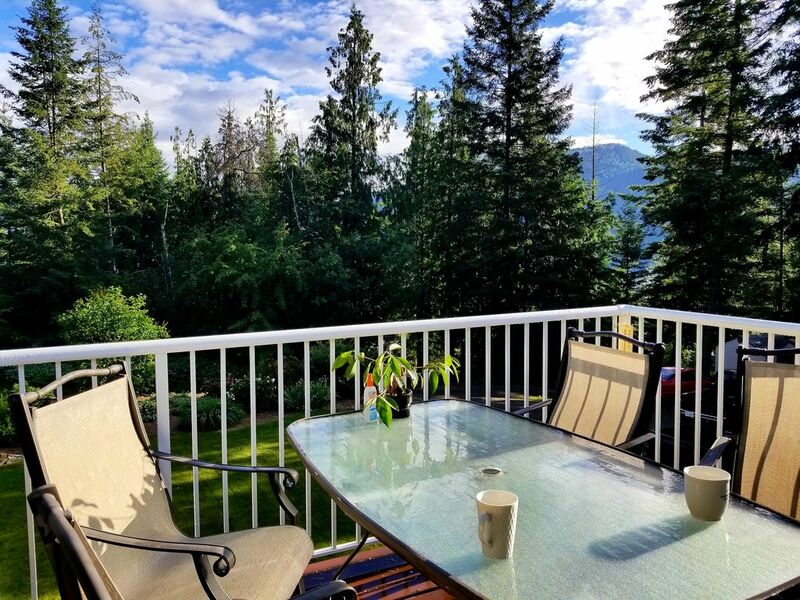 Tranquilo y privado, ubicado en el estado de Shuswap Lake. Esta suite superior de 3 habitaciones y 2 baños está decorada de forma sencilla. La suite superior se encuentra a solo unos minutos en automóvil desde el barco o la casa club más cercana. Un montón de espacio de estacionamiento para varios vehículos o para un barco. Hay algunas playas públicas cercanas, pero si la playa y los deportes acuáticos no son de su interés, asegúrese de empacar sus palos de golf, carritos de golf, motos y bicicletas de montaña. -Espero estar disponible para saludar a los invitados cuando llegan, pero puede que no siempre sea posible. -¡La privacidad será respetada! Me gustaría dejar que los invitados se pongan en contacto conmigo si tienen alguna pregunta o si necesitan ayuda con algo después de comprobar cómo fue la primera noche. -No hay fiestas ni eventos por favor. A very nice, spacious home in a lovely area! We stayed with our adult kids for a sledding vacation, lots of room to park our truck and enclosed trailer. Easy access to riding areas, and Salmon Arm. Clean, well maintained home with comfortable beds, we would rent here again without hesitation. Thanks for staying with us! My father said you were a great bunch and would love to have you guys back! Happy New Year! An amazing autumn get away. The place was very quiet, cozy. We felt at home right from the get go. The host was very helpful and friendly. We stayed at this property from August 5-8, 2018. This is a two level walk-out bungalow. Guests use the top floor which is ground level entry and easy to haul all your coolers/suitcases into - no stairs. The owner's father lives on the ground level. He welcomed us when we arrived, then allowed us to enjoy our stay with no interference. This place was perfect for our group (4 adults and 2 young children aged 2 and 4). There are three bedrooms, one king bedroom with an ensuite, 1 queen bedroom, and 2 singles; one main bathroom, kitchen with full size fridge, stove with oven, microwave and dishwasher; laundry room; large deck with propane BBQ, table and chairs. The owners even provided a bag of ice in the freezer, a carton of milk and coffee cream, a dozen eggs and ketchup in the fridge. There was oatmeal, cereal, peanut butter and a loaf of bread in the pantry. Although that was a very nice touch, I wouldn't expect that to always be there. However just a short drive away there is a Country Market grocery store that stocks most items.There were fans in two of the bedrooms if you preferred to use them although the house is equipped with air conditioning. This house is in a quiet residential area, with a very private backyard. Bocce balls are provided for use on the lawn. We spent most of our time on the deck overlooking the backyard when we weren't at the beach, the beach being maybe a five minute drive away. We highly recommend this very clean and updated property to anyone looking for a comfortable, fully equipped, economical place to stay. Really enjoyed our stay. Quick visit convinient location.